My house is wreck! It is covered in random Christmas mess! Deep in the process of putting up the Christmas Decorations I came up with this incredibly easy way to make something fabulous!! I saw an expensive but not so cute version at Lowe’s Hardware and thought “I can do better!” It is super easy and I used items I already had! Almost free sounds great this time of year!! 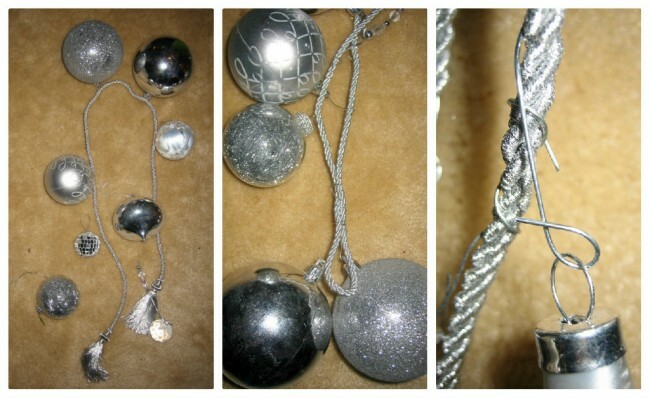 Take the rope and fold in half, place the ornaments and arrange to your liking. I used large ones on the top to small ones to dangle from the bottom. Fold your rope in half and wire it together with a hook (just bend it and wrap the wire around) to make a loop. Hooks are so flexible and they are easier to use than floral wire. Take a hook and place on the ornament (as you normally would to hang from your tree) but bend the end near your ornament closed, this is so the ornament will not fall off. Take the other end of the hook and wrap and bend tightly to the rope/ribbon. If you use ribbon you may want to poke the wire through it and wrap it to make it more stable. Randomly add your ornaments. Hang it up while you are working, if you like, to see how it will look. You may have to adjust the ornaments to make the them look full and close together. 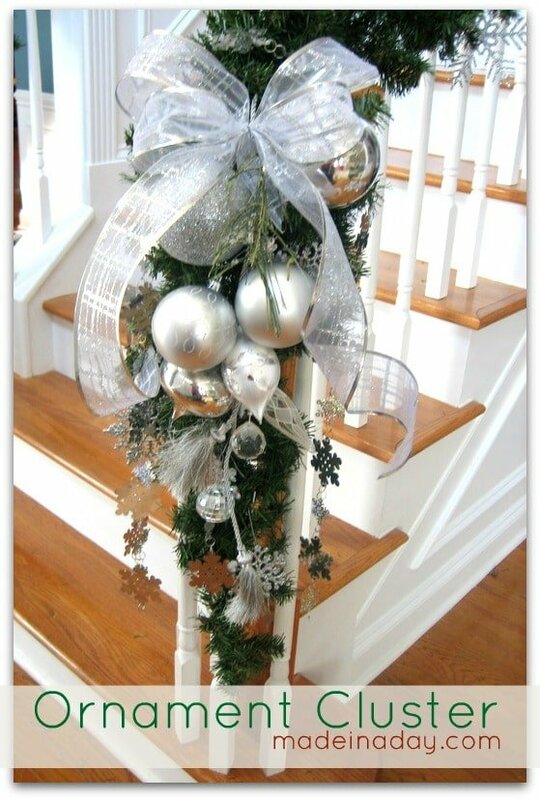 Next I added a bow and a sprig of pine to the top and hung mine from my bannister garland. And that’s it! How easy was that! You could also hang on a wall, door or door knob or where ever the holiday spirit moves you to hang it! So easy and yet so elegant, it think would look fantastic for a Christmas wedding! You’ve been featured for Functional Friday! This is absolutely stunning! I am so impressed by your talent! Thanks for linking up to Strut Your Stuff Saturday! We hope that you will come back tomorrow and share more of you amazing ideas! So simple and it looks so gorgeous! Love the ornaments you used too. Thank you for sharing! 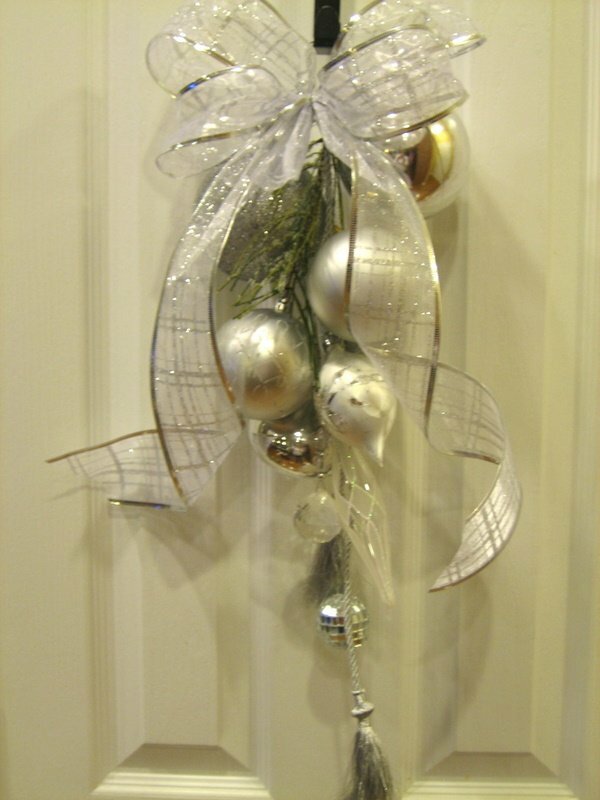 Beautiful arrangement…love the “icy” colors of the ornaments! Linked up after you at One Project at a Time – this looks like a great idea! Inexpensive, easy to use what you have around the house – and beautiful! I’ve been wanting to do something like this, I’m definately putting this on my To Do list this week. Thanks for the decorating tip! I love easy yet elegant. Found you at Meet Me Monday. so pretty! I love the silver! Thanks so much for linking up! Very elegant — and zero cost is fantastic! A classy way of making ordinary things come alive! 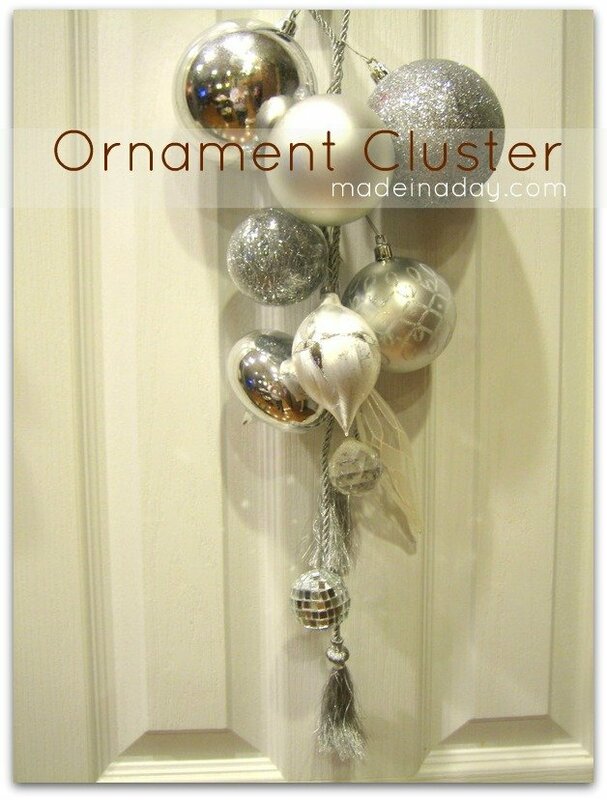 Beautiful ornament arrangement…thanks for the ideas.